Edition of 500 books + 25AP. 124 page hardcover coffee-table book: 9.5 x 11.8 inches (24 x 30 centimeters), printed on gorgeous 120 gsm Cotton Wove paper. The book features over 80 photos, most of them never before seen online nor in print. Each edition is carefully numbered and signed by the artist. Custom inscriptions are available. 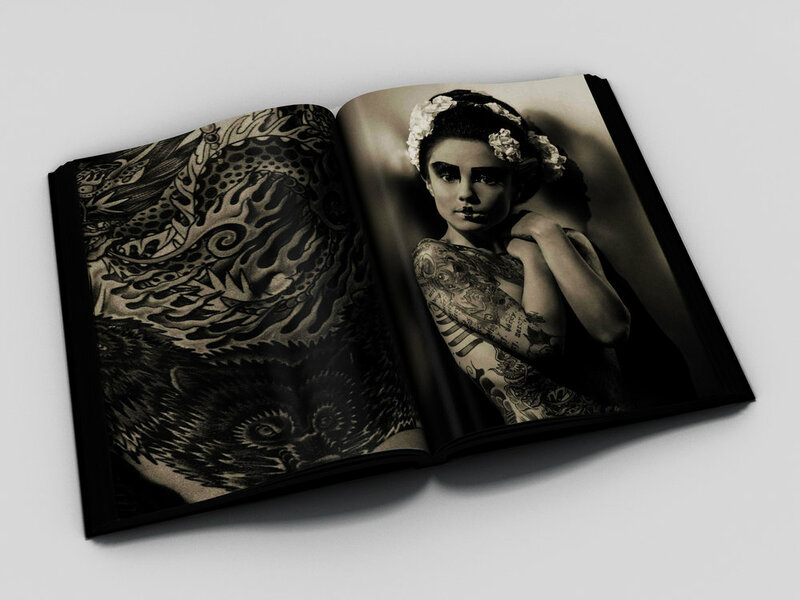 This book will only be printed once, and is limited to 500 copies +25AP. It is designed and crafted to be an art piece in it's own right. GEISHA INK is artisanally printed in Verona, Italy. GEISHA INK tells the intoxicating story of Ginzilla, revealing and subverting female archetypes through a visual exploration of sexuality, taboos, eroticism & culture. Our depicted heroine was born into a traditional family of uncompromisingly strict conservative values. The effect was suffocating to her wild heart, engendering acts of rebellion perhaps most visible as the arresting marks of defiance, written in permanent ink on the canvas of her body. These images tell the story of her life; illustrations of tigers, wolves, and dragons contrast societal expectations of female submission and obedience. Ginzilla’s first lover was a tattoo artist, a predilection which has guided her sexual journey. All of her body-art was composed and executed by lovers, compounding its personal meaning to her, while providing a veritable map of her life. She is presented for the viewer’s meditative contemplation as a symbol of strength, defiance, and unapologetic female desire; her body on display for worship, the tattoos adorning it, as if prayer beads of a rosary.